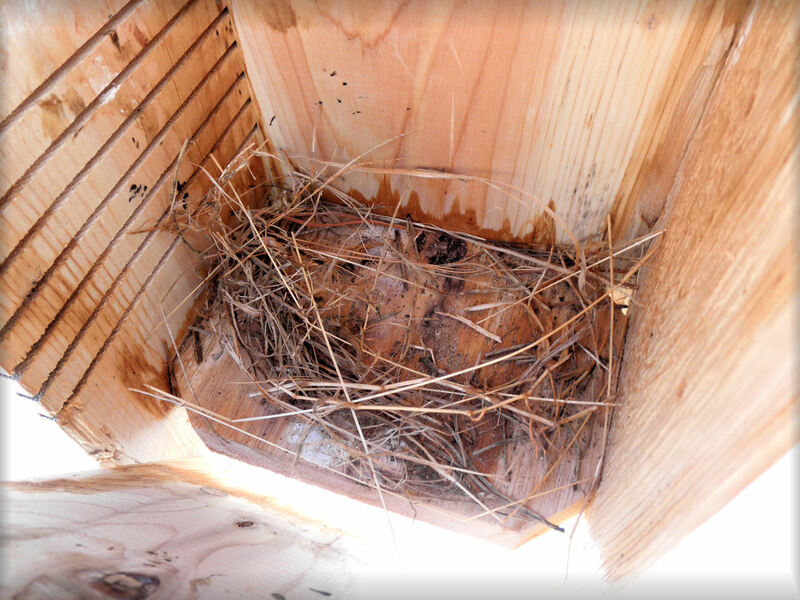 #18 – This box had the most amount of materials of the 4 that had nests started. This is much later than last year. I’m sure the colder weather is making a difference when these birds decide to start the raise-the-family thing they do! Do you not find the wire bottom riser helpful? Can you explain your question, please? Not sure what you mean by “wire bottom riser”…are you referring to the Noel guard over the entry hole? No, wire riser for the bottom of the box that the birds build on. Helps deter blowfly. I am experimenting using the hardware cloth bases about an inch above the nestbox floor in some, but not all, nestboxes so that I keep records on the blowfly larvae. It is not 100% foolproof, I’ve found, to saving larvae reaching the nestlings at night. Many sit inside the nest, not at the base of the nest, so they don’t fall through the bases. Some do; many do not. I experiment on many different things on this trail, especially now that I have more nestboxes and locations. I insert them under a built nest before eggs are laid and incubation starts. My personal preference is not to leave the bases in prior to nestbuilding. I just use my metal wide scraper and lift the nest up about an inch inside the nestbox and then insert the ready-to-fit base. She never knows the difference because most of the nestbuilding is in progress! When she returns to the box, the nest is still there as she left it, just a little higher than before. My record-keeping for this experiment is not complete. 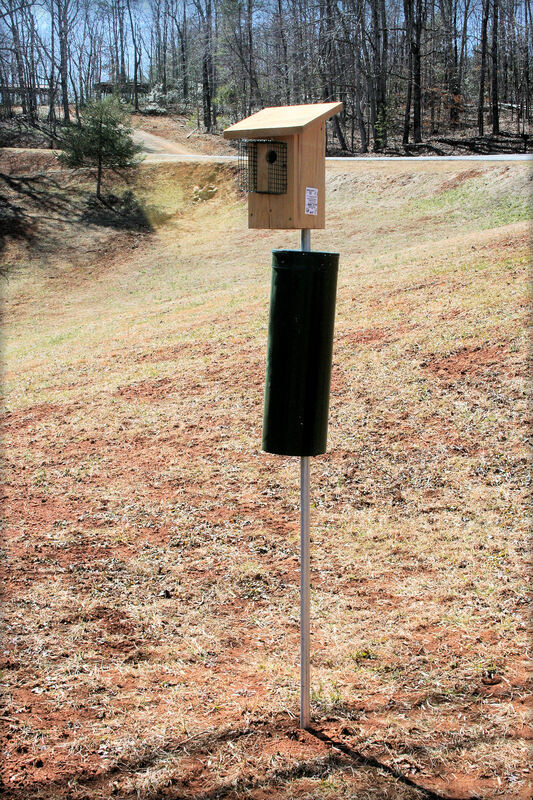 The Virginia Bluebird Society recommends using the bases. I think they also help keep the nests dry. I also use the wire bases, yet blowfly will enter. I found using coir for nesting material is better than pine needles. I set a clump near the box and BB selects strands to construct. I have even replaced a pine nest with coir when I found blowfly. Have you seen my recent post on Bluebirds? Thanks…..we can offer support to each other! War on blowfly–oh yes, you got it there and I’m with you 100%! Though I am a “naturalist”, in bluebird conservation, I need to intervene. What’s the point of luring birds to use our manmade housing and then tell them, “Sorry–you’re on your own!”. I dissect the nests to see if blowfly lived in spite of my efforts after the baby birds fledged. Each nest is different. There is no such thing as cookie cutters with these birds. I like mixing the natural with the human when it comes to helping the birds. Isn’t that what “birdfeeding” is? Have a super spring! You too and if you send your link I will attempt to add it to my posts. Take care out there. Ticks are already out in Central Virgina–OMG! This is the URL to my blog/website: https://woolwinehousebluebirdtrail.com/ Thanks! Thanks for the support of my blog! I corrected the title–thanks for catching that.